Eddy Toyonaga began his discovery of yoga in 2007 in a hot yoga class. Everything changed when he eventually took a Vinyasa class. Dancing through the flowing asanas and linking his breath to his movement spoke to him like nothing had before. Initially, he was drawn to the physical benefits of yoga but soon realized that he was scratching the surface of something much bigger. Yoga calmed his mind, expanded his heart, nourished his soul and gave him the opportunity to create space where infinite potential exists. 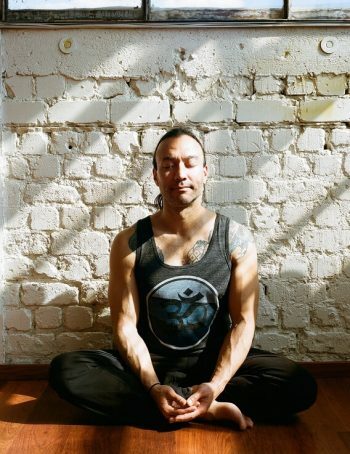 Eddy invites you to come and playfully push your edges to groovy beats in his fiery Power classes or to slow everything down and gently peel layer upon layer away in his chilled out Yin classes. In both classes, the intent is to connect to the deepest part of your self uniting mind, body and soul. Eddy is dedicated to helping people build strong, flexible bodies and develop a focused mind without compromising the importance of the soul. Eddy Toyonaga currently lives in greater Tel Aviv with his family where he continues to explore the many teachings this never ending path has to offer. To see Eddy Toyonaga’s weekly class schedule click here and fell free to contact Eddy here. Canadian born, Eddy’s first taste of yoga was a hot yoga class in Victoria B.C. Canada when he visited his sister and she insisted he come with her. He barely resisted as he felt a bit stiff and thought a gentle stretch would be good for him. Little did he realize that the intensity of the poses mixed with the heat demanded all of his focus and attention which that kept him coming back for more. His true love affair with the practice began a couple of years later when he took his first Vinyasa class in Vancouver B.C. Canada, led by Eoin Finn. This was a complete game changer for him, he became instantly hooked to flowing with the breath and to baring weight on his hands in poses like downward facing dog and other arm balances. He soon became a handstand and inversion lover. He started practicing every single day and one thing led to another. This eventually guided him to embark on teacher training courses which brought him to the path he is on today. 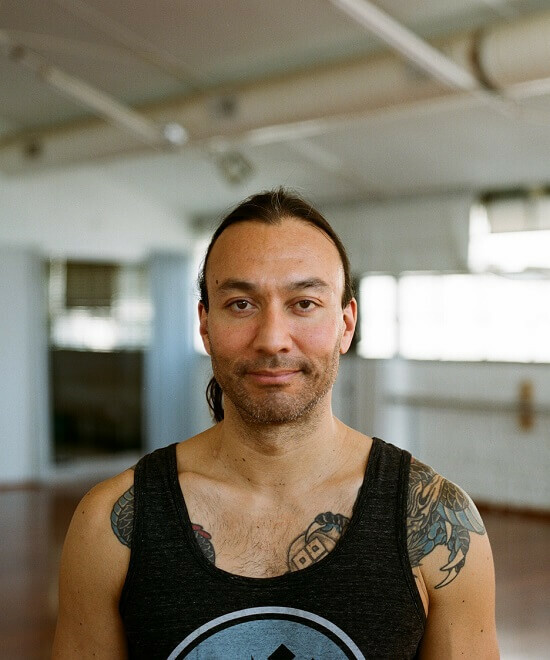 With the influence of having been raised in a Buddhist household, Eddy enjoys incorporating heart quality themes in his classes with the intention to fuse the mind & heart together, to create a distance from one’s ego and instead to connect to the higher self. He believes it is from this sacred space that we are able to find more clarity, meaning and purpose in life. He teaches with passion and ensures his classes are accessible to everyone. Eddy’s style is primarily influenced by a few lineages of Vinyasa yoga; Anusara, Vijnana and Power Flow. His classes are designed to challenge both the mental and physical characteristics of our bodies. In his classes you can expect to be moved dynamically to build internal heat. He will guide you to meet your healthy edge, to peek at your boundaries where transformation will occur safely and organically. You will be reminded to move from the intelligence of your body and to rest as often as needed. Eddy encourages you to practice from your heart as opposed from your ego. Suzanne Faith holds commands space like no one else. I feel like I’m cocooned in a blanket of light and acceptance in her presence. She blends her skillful knowledge of various yoga lineages as her offering. Nico Luce is a master storyteller. Whether he shares the wisdom of the Bhagavad Gita or the philosophy of the Tao Te Ching, you will be completely mesmerized as he leads you from pose to pose. Christine Price Clark alignment cues are phenomenal. Her expertise will bring you safely to incredible depth in your body taking your practice to a whole new level. Kenny Graham is all heart. He incorporates chanting, pranayama, mediation and a strong fluid vinyasa to music to allow your soul to fly in his superbly well rounded classes. Meghan Currie moves to the beat of her own drum. You will create art with your body as she leads you in her sequences of pure creative genius that will rinse you out from head to toe. Mike Nichols reminds us to keep shining. He fuses his experience in martial arts, meditation, energy work and sound healing in his teachings as a vehicle to lift your vibration. Chris Chavez is a true teachers’ teacher. He’s trained thousands of teachers globally and across North America but remains grounded and fully approachable as a down to earth yogi. He will challenge you yet uplift you simultaneously. Eoin Finn is all about the upward spiral of bliss. Hugging your neighbors next to you before class starts is usual practice and thus begins the conduit of this energy. If the opportunity presents itself, you mustn’t miss his class. Dylan Werner’s progressive style shapes the constant evolution of yoga. He is an inversion and arm balance master and is regarded as one of the world’s leaders in yoga strength training. Tracy Groshak embodies the importance that less is more. With a clear understanding of biomechanics, she combines fluidity and precision in an intelligent and accessible approach. Ryan Leier’s mission is to make yoga accessible to everyone regardless of age, gender, race or religion. He brings creative energy to every class he teaches while expressing ancient traditions to his students. Melissa Donohoe, Heather Williams, Seane Corn, Ragunath, Sianna Sherman and Noah Maze.